Life is full of annoyances and sometimes things just don’t work out the way you want them to. But if you always have a prayerful heart, you’d be amazed at how God can work out even the most insignificant problem in your life. I’ve heard stories about heavenly rescues in all kinds of ways. Some rescues are quite dramatic, some very heartrending, some unbelievable. Yet many are just little and simple, which a non-believing person would call “luck.” But if you believe and had asked God to be in charge of your life, you wouldn’t believe in coincidences, but rather you’d believe in a God Who wants to be involved in your everyday life because you asked Him to. Let me share Grace’s story who at this time of my writing is away in Tennessee. “Please pray! I’m still inside the tram and I’ve got to go to Gate 69 and I don’t know if I’ll make it on time. My plane to Nashville leaves in three minutes!” Grace’s voice on the cell phone sounded panicky. And right away I pictured a helpless girl trying to walk fast, dragging a hand carry bag. Grace cannot run because she wears orthopedic shoes. She always lags several feet behind when walking with a group. She tried asking for a wheel chair at airports but she found out this didn’t make her travel any faster. So she’d rather walk. 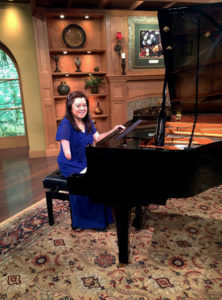 Grace gives piano concerts all over the country to find sponsors for the Adopt a Minister Program. Sometimes, J.R. and I go with her, but often, she goes by herself. She has had missed a few flights and ended up staying in motel rooms for the night, all the while calling me and asking for prayer. At one such time, she missed her flight three times in one setting and at 2:00 a.m., she was just settling in a motel room. And to make matters worse, she lost her luggage. One luggage ended up in Orange County airport, the other at Ontario Airport. So we prayed and a few hours before her concert, the suitcases showed up. During her first concert tour back in 2001, Grace traveled with companions by Greyhound bus. The long trips were grueling and trying, especially when she lost her luggage and lost her gowns. She called me and asked for prayer that they’d find her luggage, but no luggage showed up. During her concert the following night, they announced her loss. And amazingly, someone in the audience gave her a set of new suitcases the following day, and another lady gave her two new gowns while others gave her money for new clothes. Grace felt her help came from heaven. Now, can you call this next story a heavenly rescue? Eight years ago I led a group of young people in my church, and for the 13th Sabbath Program, we planned a telethon “skit” to inspire the congregation to give more. For three days, the children practiced. I made a giant map of South America, the focus of the offering, and placed electric lights on it. During the “skit” telethon, I had planned to light up the lights gradually. When I arrived in church on Sabbath morning, the children were already there. I had expected to see them filled with excitement; but to my dismay, their faces looked sad. Then I heard the bad news. “Ms. Reva, we don’t have microphones! Someone robbed the church last night and took the whole PA system! What are we going to do?” the children asked in unison. The children understood my disappointment and I understood theirs. We prayed and right after, they found their places on the pulpit. Our two 10-year-old telethon hosts shouted their parts. After the program, the children went down the aisles with offering plates to collect the 13th Sabbath offering. I was quite amazed! We collected four times what we normally collect in other past programs. The brethren felt bad for the church’s loss. A few days later, the police recovered everything that was stolen and the following Sabbath, the church had a new alarm system. I can call this a heavenly rescue. Now back to Grace…did she make her flight? Since she didn’t call again, I figured she made it OK. Two hours later, my phone was ringing. She cried, “I’m here now, but you won’t believe what happened. While in the tram, I started fussing at God, ‘What in the world are you doing? Can’t you see I’m helpless? God, why do you make things hard for me?’ But I continued asking God to rescue me because I didn’t want to miss the plane and lose my luggage. Would you believe, in a matter of seconds, I heard the fire alarm go off and people had to go outside the terminal. Obviously, the plane couldn’t leave and amazingly, the tram stopped exactly at Gate 69. I knew God rescued me!” Grace’s voice was full of excitement. God is indeed a merciful God, for even when we complain to Him, He still sends us heavenly rescues.